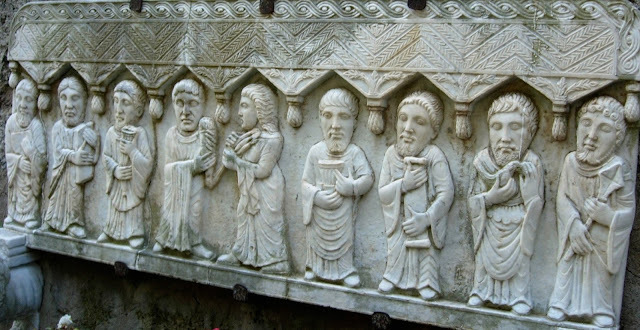 While they had plenty of worries, I don't think our ancestors gave much thought to the earth's rising temperatures, burning of fossil fuels, a trash-centric way of life or other eco-systemic issues. As my friends can attest, I have, of late, become a bit crazed with how much garbage we produce. 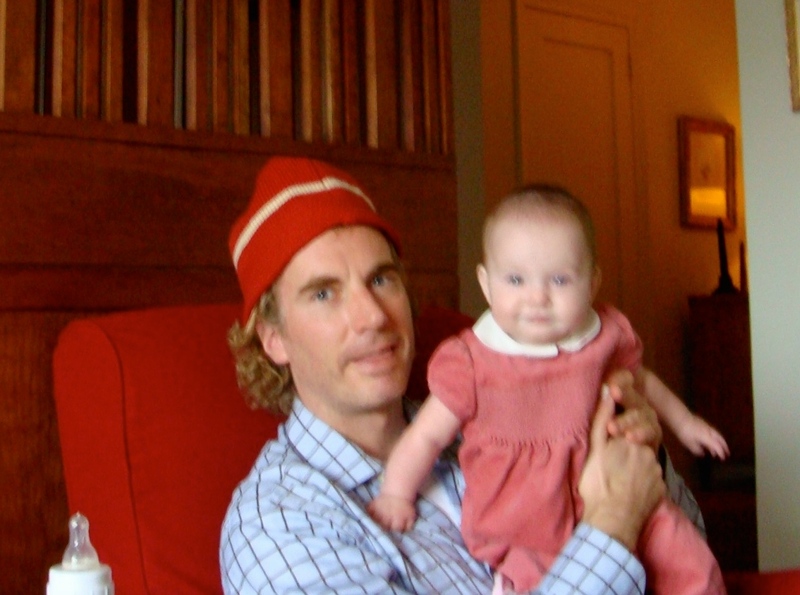 Perhaps it is because I am now a parent, and worry about the world I am leaving my daughter. Or perhaps, it is just part of the process of getting older (wiser?). But whatever the case, we produce a great deal of wasteful garbage. 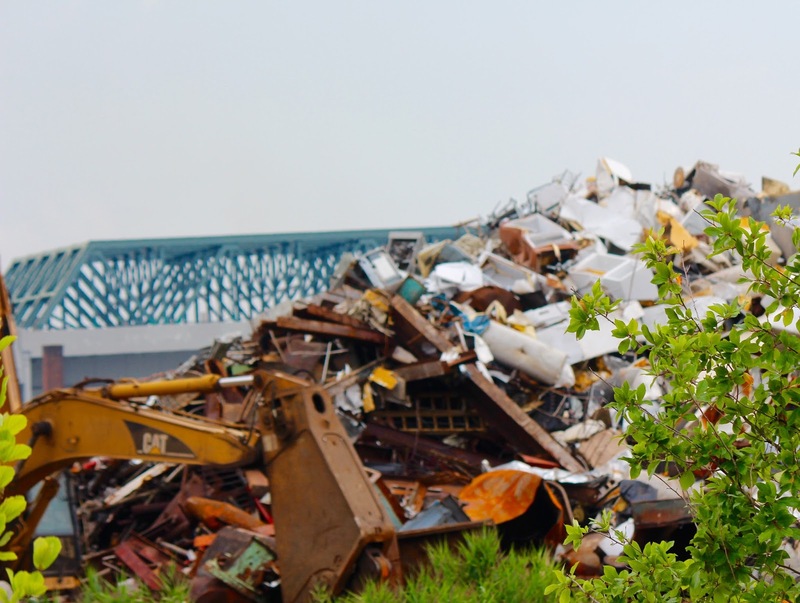 According to a recent Duke University study, the average American produces 4.3 pounds of waste everyday, way up from 1.6 pounds produced per person in 1960. Seems like we can all stand to lose a "few pounds"! We are just three people in my family -- three people producing a lot of trash -- a least 2 bags of household trash, PLUS a huge bag of plastic recyclables, AND at least another bag of paper products -- every week! Three People! Despite very concerted efforts to limit online ordering, using cloth bags at the supermarket, and reusing as much glass and paper whenever possible, we still produce an exceptional amount of trash. Where does it all go? Mostly, I presume, to one of the 3500 methane producing landfills in this country. Spending time by the beach always makes me think about the state of our precious planet. One of the biggest trash producing culprits -- plastic. Plastic is everywhere and has become indispensible. It's convenient, it's nearly impossible to avoid, and getting rid of it is hardly a popular opinion, just yet. 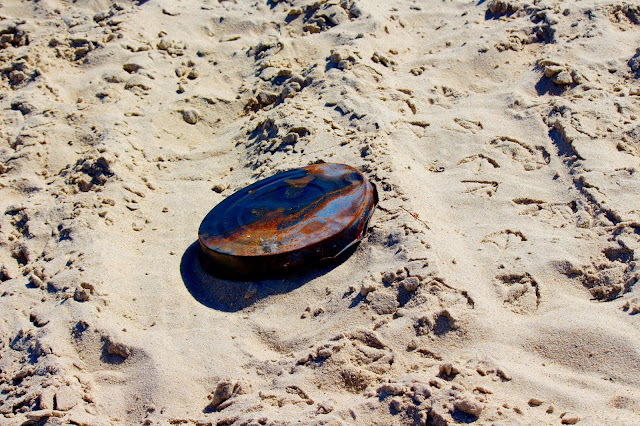 I am always picking up trash at the beach. One Saturday morning, early in the summer, I picked up 10 deflated helium balloons. Many of them said: "Get Well Soon." I couldn't help but think we should be sending this same wish to our planet. It takes 500-1000 years for plastic to break down. So ostensibly, unless it was burned (illegal?) every piece of plastic that was ever produced still exists, in landfill, in gutters, in our oceans. Take a moment on that! Americans buy more bottled water than any other nation, about 2.5 million -- per hour! So let's just stop it! Instead, reuse those bottles, or better yet, fill up reusable bottles. Here in New York, a small bottle of water can cost $2 (if it were gasoline, that would amount to over $12/gallon!). Oil is a chief ingredient in plastic, some of which invariable leaches into food product, especially if the product is microwaved or overheated in transport. That certainly cannot be good for the body, and is by no means organic! What's more, according to Peter Gleick of the Pacific Institute, we used approximately 17 million barrels of oil in 2006 to produce plastic for bottled water in America. This also produced over 2.5 million tons of CO2. By the way, this does not include the energy used to fill, ship and cool these bottles. Besides oil, plastic contains toxic chemicals, including flame retardants, fungicides, and pigments. That doesn't sound remotely healthy! 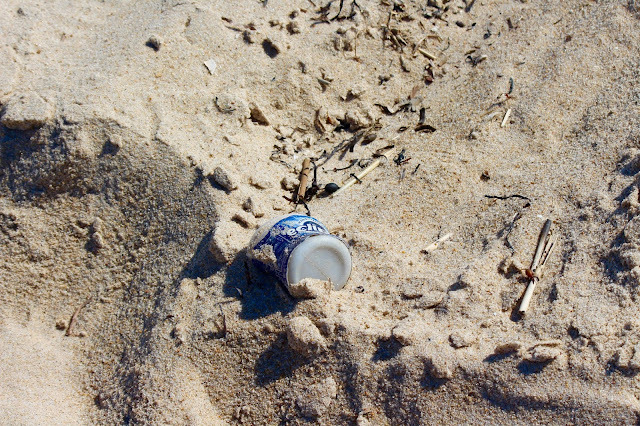 Beautiful Long Island beach, which we invariably find trash floating within. Ok, enough of the depressing stuff! As I already said, limit the use of plastic water bottles. This alone would be providing a huge service to our planet. Buy a bunch of stainless steel bottles and put them everywhere -- car, work, home. Refill them! Teach your children about responsible containers. Children should be taught that their actions matter, it's their future and plastic pollution does not need to be the norm. It isn't hard to do, some of it is just mere cheerleading when they make earth friendly choices, and encouraging awareness when they do not. Kids take cues from adults, so be sure to set an example. It's not hard - use reusable water bottles (repeating myself) and bring your own containers/bags when leaving the house, consider ordering drinks in restaurants without straws, and when you notice trash on the street, pick it up. Kid's will get the message, that mindful choices about plastics and garbage can make a difference. We have choices and businesses respond to our choices. So demand less disposible packaging and less throw-away product. Be sure to buy bio-based packaging whenever possible. Use the buy-in-bulk stations at your grocer, and bring your own bottles to fill. I have been saying for some time now that we should encourage businesses to offer low-cost cold water bottle refill stations. This would not only remind customers to use their own water bottles but it would inevitably be a draw for people to come into the business, and have a look around. Believe it or not, this is a shot looking out from the Whole Foods parking lot in Brooklyn, in the trendy Gowanus section. One final suggestion -- use biodegradable materials when mailing packages and encourage your favorite online stores to do the same. Aside from being incredibly bad for the planet, the styrofoam peanuts are maddening -- they are impossible to clean out of a large box, stick to hands while trying to do so and the little bits end of flying irretrievably all over the house. It's just time for them to go, from the planet! I just read that, once again, 2014 was the hottest year on record -- not a celebratory milestone. But that said, thanks for making an attempt at being a part of the solution and for making good choices. Our precious earth seems to be keeping score, so every effort counts! 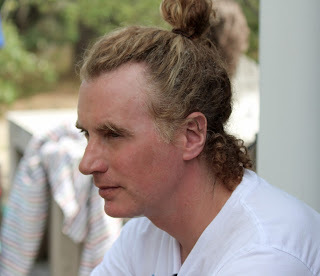 Pondering the planet, in a man bun! This time of year, when the outdoor temperatures remain warm and mostly humid, I try to prepare dishes that are refreshing, light and crisp. 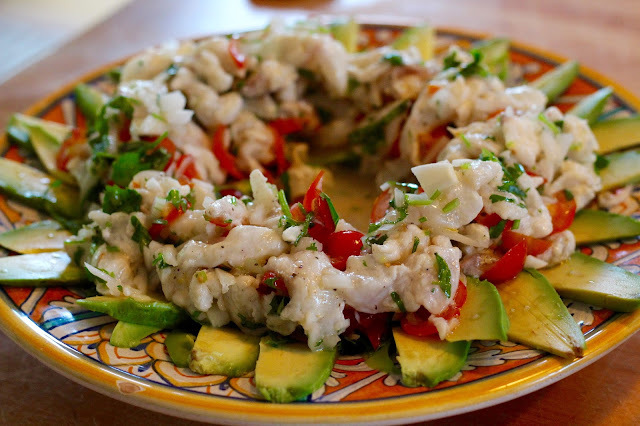 My mid-summer go-to: Ceviche -- which is a fish dish popular in Central and South America, and therefore has a delectable Latin flavor, and some kick. The one catch to this dish -- the fish is undercooked, even raw in parts. 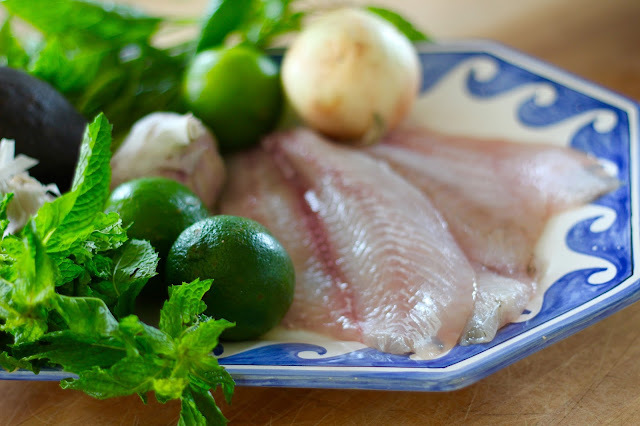 The only cooking the fish receives is from a citrus marinade, often limes. So if you aren't into raw fish, this may not be your dish. Always be sure to buy your fish from a market that caters in super-fresh seafood, where the turnover is frequent. Markets that sell to sushi-making chefs are ideal. 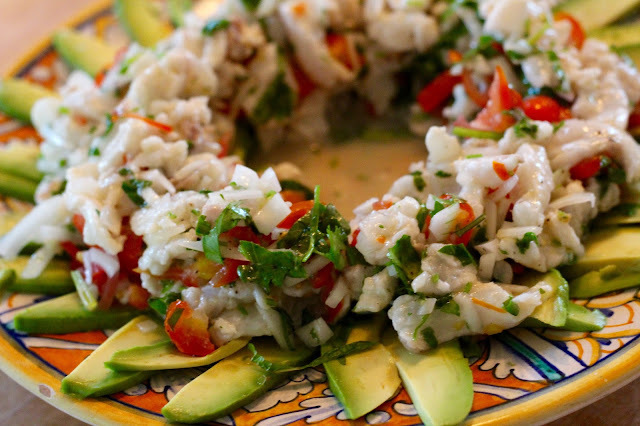 Ceviche can be made with fluke, sea bass, halibut and other white fish. While popular in many restaurants, I stay away from crustaceans. Shrimp, scallops, lobster, etc. 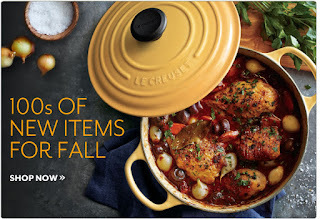 are best cooked with traditional heat sources. 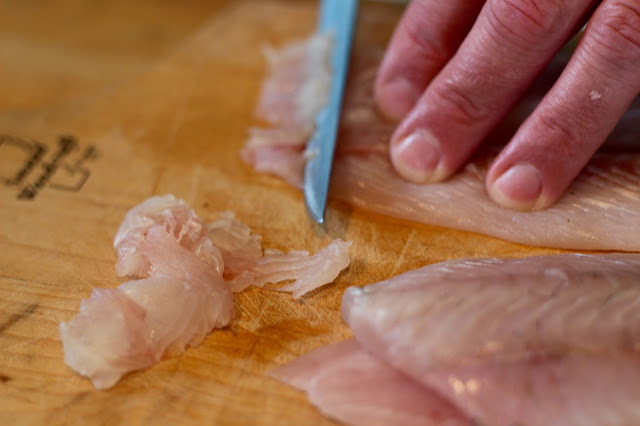 Before cutting fish, be sure to wash under water and lightly salt. Also, cut out any deep red sections and check for other areas that may contain bones. Remove these annoying rascals! 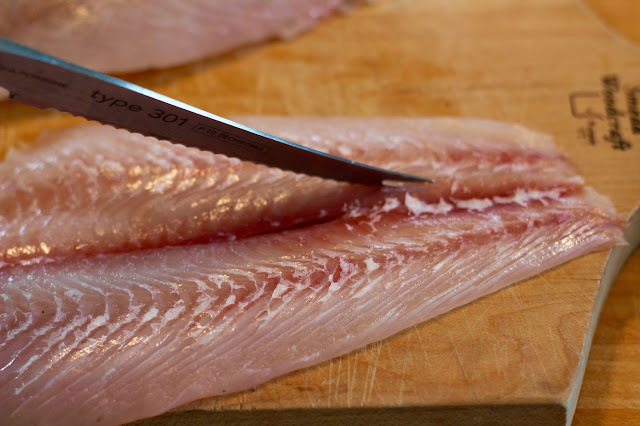 Using a sharp knife, cut the fish into thin pieces, preferably on the diagonal. I do not care for large chunks. Thin slices delicately delight the palate, and present a more gourmet texture. Place fish in a bowl and add lime juice. Add chopped onion. The fish and onion are the two ingredients that we are cooking here. Refrigerate for at least 30 minutes. All the fish pieces should have turned white on the outside. Meanwhile, mix the diced cilantro, mint, basil, honey and of course, garlic! Quarter the tomatoes and discard any juice. Mix with the fresh herbs. I prefer using tomatoes rather than red peppers in ceviche. Tomatoes have less crunch and don't interfere with the smooth texture of the fish. Combine the herb mix with the fish and let chill for another 10 minutes. Be sure not to over-marinate, it will overpower and overcook the fish. Serve the Ceviche over a bed of avocado, drizzle with olive oil and season with sea salt crystals, ground pepper and hot chili pepper. Cilantro, is indigenous to the Mediterranean region, has been used for over 3,000 years, and is derived from the Coriander plant and therefore is the same herb. Mediterranean and Asian cultures are likely to call it Coriander, while in the Americas, it is more commonly referred to as Cilantro. While I adore Cilantro, some seem to have an adverse predisposition to the herb, equating it to a soap-like flavor. Cilantro/Coriander is used in both sweet and savory dishes and is an essential ingredient in curry powder. For those who read my last post, I cut my hair! 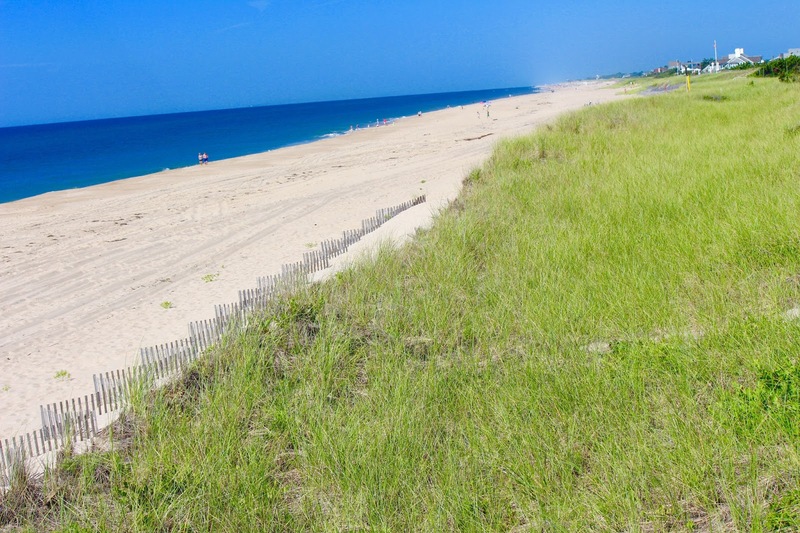 If you haven't been to the Hamptons, this (above) is how the beaches look -- for real! The award-winning coastline is still mostly unaltered, accordant to nature, undisturbed -- well, for the time being, that is. The Eastern part of Long Island is absolutely pristine -- mostly because it's really just a giant sand bar that sticks out 100 miles into the Atlantic Ocean -- it's heavenly. 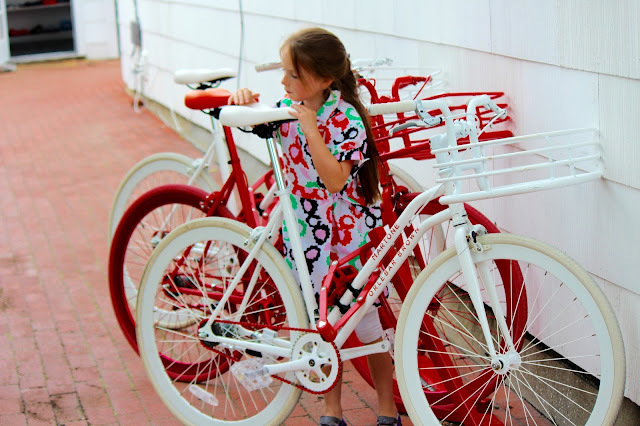 Of course all the bikes match in the Hamptons. And, seemingly, the children respectfully match the bikes. 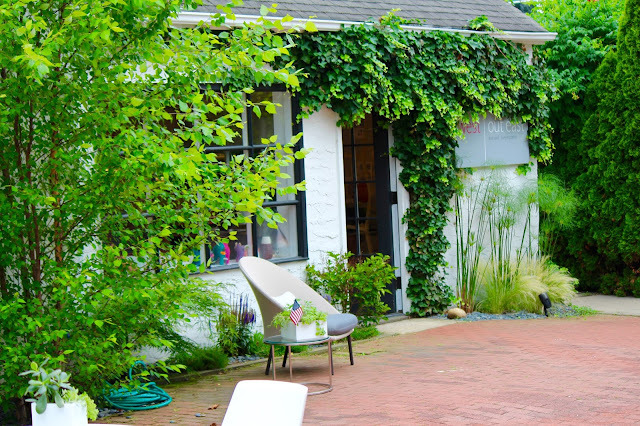 A beautiful mews sitting area, just off of Main Street in East Hampton. 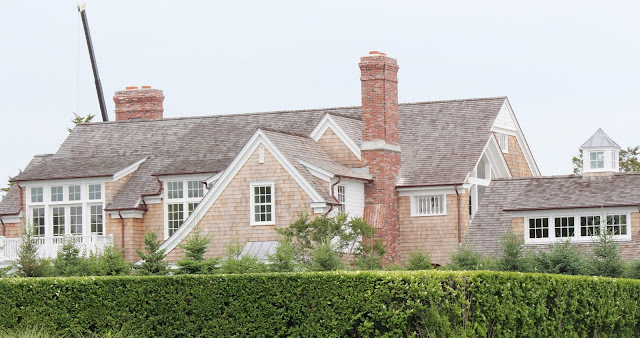 West Hampton, Southampton, East Hampton (above), and Bridgehampton all have fanciful (extravagant) shopping. Side note: isn't it interesting that some of the town names are two words, and some are one? 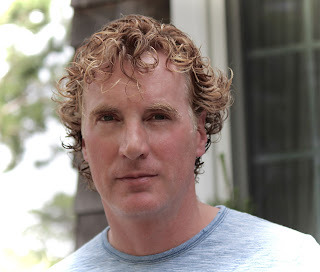 Sag Harbor, a historic whaling village settled in the 1700s, was, until recently, locked in a time warp, with quaint knick-knack shops, scruffy 99 cent stores and bygone retro pharmacies. It is now, however, quickly becoming an important style destination (above). I like this photo (above) because those chairs are absolutely fantastic, reminding me of a 1960s cartoon (Dr. Seuss, perhaps). I half expect them to come to life. Just fabulous. Also, directly behind them is my new favorite men's shop in East Hampton. Orlebar Brown is a European designer that carriers tasteful, colorful, somewhat retro swim shorts (albeit very expensive). These shorts can be worn to the beach or to Whole Foods and are cut to a reasonable length -- high on the thigh, where they should be, reminiscent of 1980s Bjorn Borg tennis shorts! 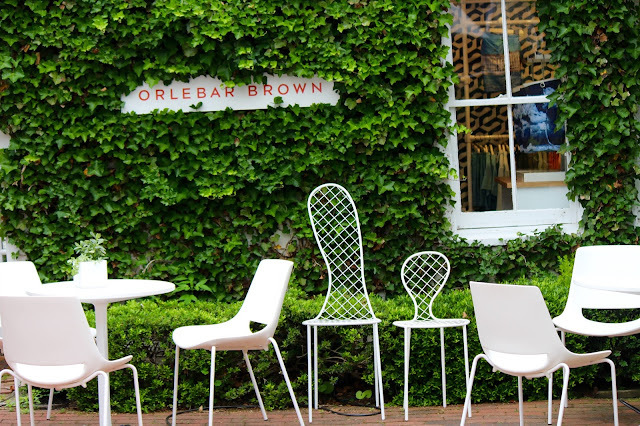 Hopefully, designers like Orlebar Brown will help extinguish the board short trend. Those unflattering board shorts should be only worn by surfers. Why? Three reasons -- first, the baggy board shorts leave the worst tan lines on men; second, all that fabric can literally cause men to drown; third, most men look silly covering half their bodies while expecting their woman counterparts to be wearing virtually nothing at all! Just saying! 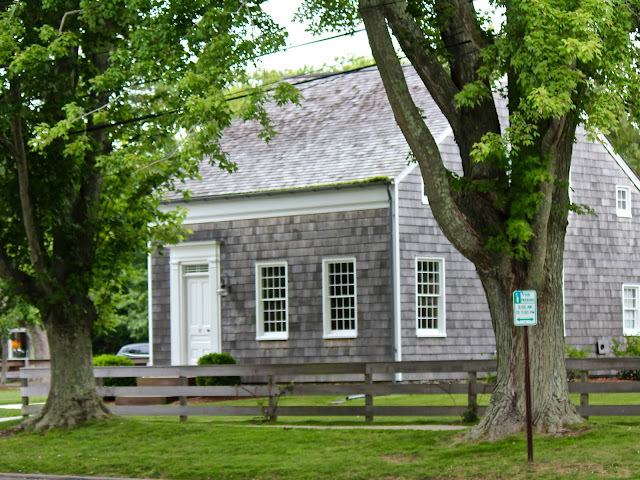 Henry Lehr (above) is another tasteful shop located in Amagansett and in East Hampton (they also have stores in Manhattan and elsewhere). The clothes are casual, yet colorful, cuts are stylish and functional, and many of the radiant fabrics are imported from India and other exotic locations. Our daughter understands the importance of keeping a vibrant wrap on hand when we are by the beach. The temperature swings can be sudden and unpredictable, especially in the evening. The Hampton Chutney Co, in Amagansett, is a fantastic eatery, especially for lunch. They make the most delicious south Indian dosas, chutney and lassies. It is not clear, however, what is up with the proprieters -- they are rumored to be running a curious commune. 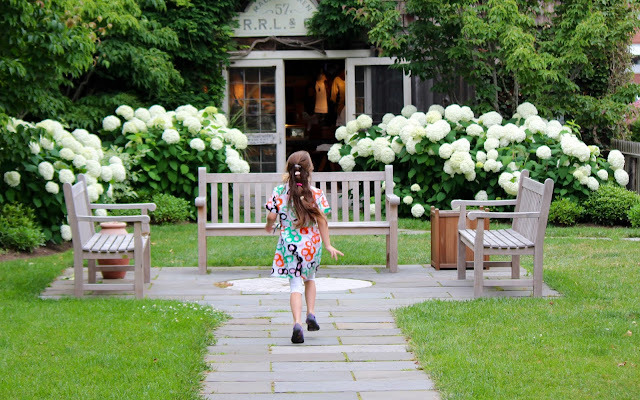 Aside from palatial beach homes, fancy shopping and impressive scenery, the Hamptons are steeped in tradition and history. Throughout this picture-perfect region, with misty beaches distilled by the sun, are many structures that are listed on the National Register of Historic Places and are significant because they predate the Revolutionary War. 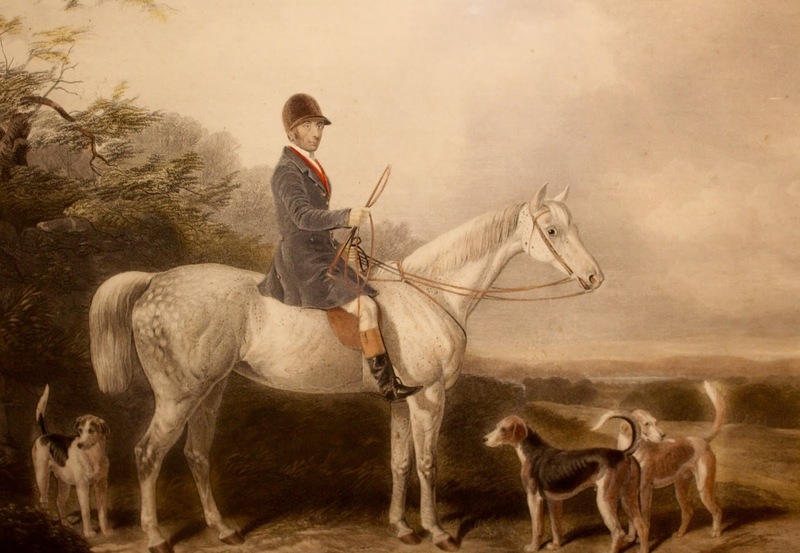 Numerous homes date back to the English Colonial period, the late 1600s. Cool! There are so many farm stands and markets in the Hamptons that an entire book could be dedicated to this one rich subject. 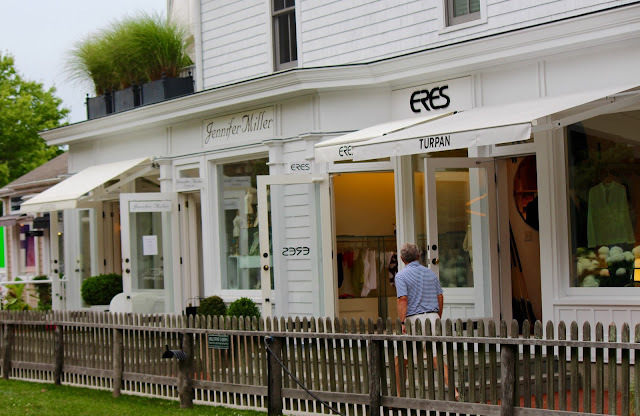 My favorite market, although small, is open on Saturday mornings and is located in the Springs of East Hampton. The Springs area is known in the art world as a place of abstract creativity. Such artists as Jackson Pollock, Willem de Kooning and Randy Rosenthal created famous works here. 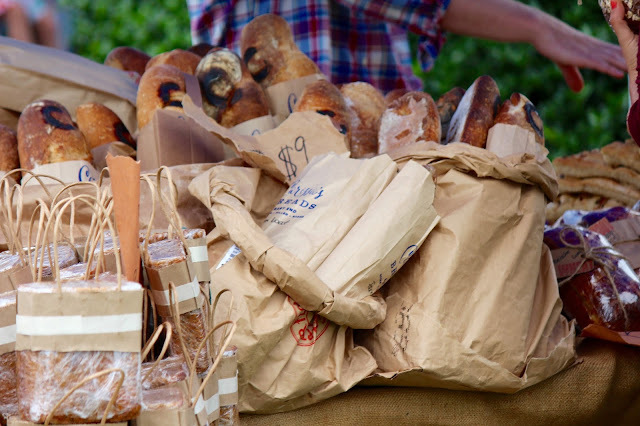 Only in the Hamptons can $9 loaves of bread be found. 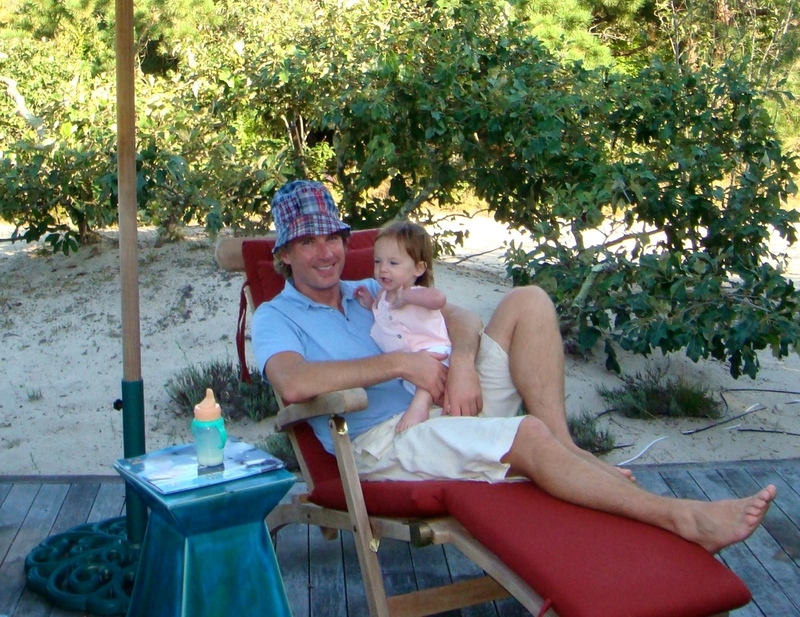 Easy living at Amber Waves Farm Stand in Amagansett. 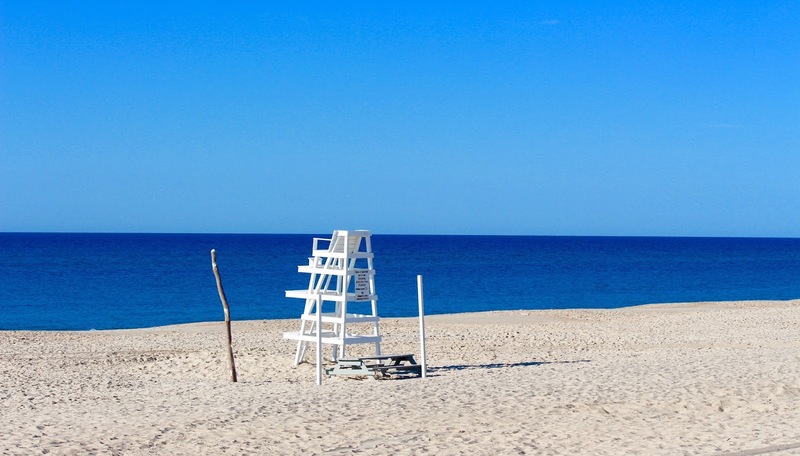 Hopefully, the sea will remain unchanged, the towns unchanged, the beaches unchanged -- so that generations can continue to enjoy the flawless, unspoiled beauty that has always been a trademark of the Hamptons. Thanks for joining us on this quick journey. Lounging on the back steps. My daughter doesn't want me to have this hair mop cut off. Summer Greens, Makes You Feel Fine! The jury is in -- this year's 'it" color is green! 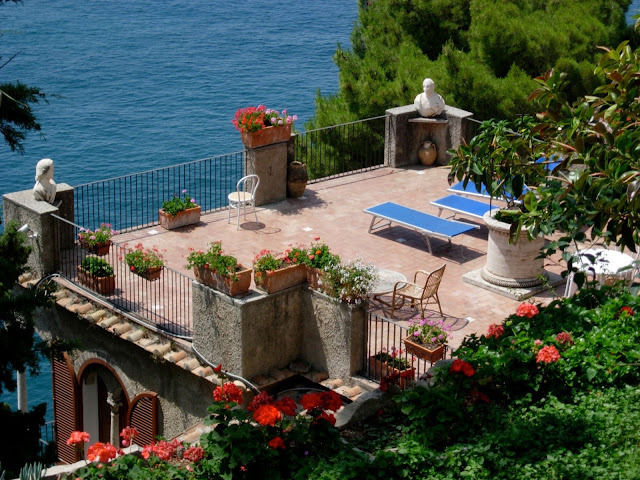 Recalling our art-filled trip to the Amalfi coast where we enjoyed the Mediterranean diet -- lots of greens, lots of vegetables. This time of year, most of what I serve for dinner comes directly from the farmer's market. The popular movement and term du jour, Farm to Table, is catching on for a whole host of reasons -- the produce is fresh, less energy is used transporting it, it supports local infrastructure, and it's honest eating. I believe there is a social responsibility to local, sustainable food -- the impact of food choices that we make today has a long standing impact on the planet for our future -- and for our children's future. I feel fortunate that I can find farm fresh, organic food almost all year round. The ends of the beans tend to be tough and less enjoyable to eat, so take a minute and cut them off (preferably by hand). This is a great activity for children who wish to help in the kitchen. I love sautéd vegetables, especially kale and swiss chard. But some vegetables take too long to cook in a sauté pan and become a mushy mess as a result. 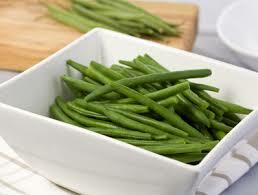 To avoid sogginess, quickly blanch (boil in hot water) the green beans for 2 minutes. 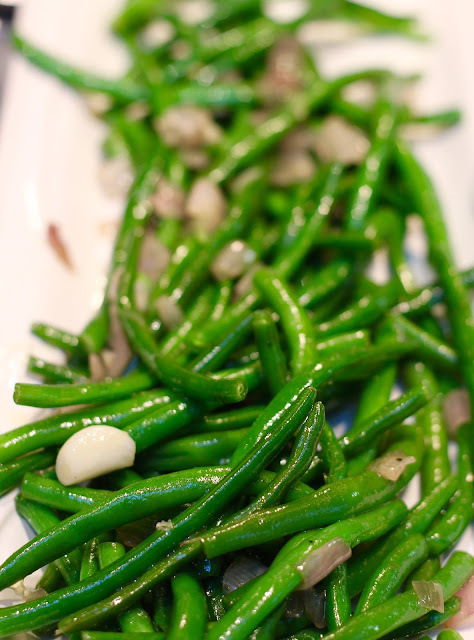 After blanching, remove the greens and immediately put them into cold ice water, to stop them from cooking. Set aside. 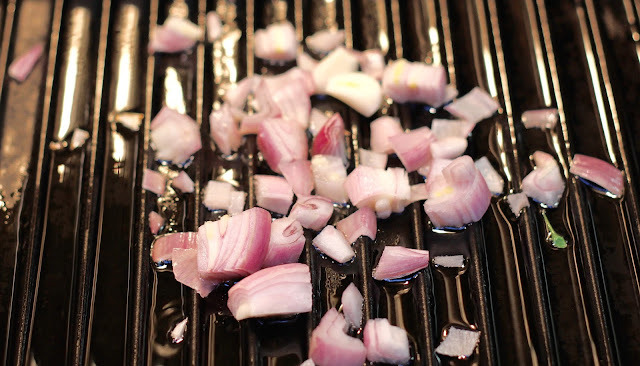 Sauté the garlic and shallots in a medium sized skillet or cast iron grill pan until soft, for about 2 minutes. Add in the chilled green beans and sauté for another minute. Add in the Vietnamese Fish sauce, perhaps a tablespoon of butter (if desired) and season with salt and pepper. Sauté for one more minute and serve either hot or at room temperature. Everyone is going to love it!!! I owe special credit for this dish to my friend, Tati, who was taught this recipe from her mother, Tram Nguyen, one of the first Vietnamese chefs in Brooklyn (in the 1970s and 80s). Some may remember her restaurant in Cobble Hill -- Delices de Saigon. 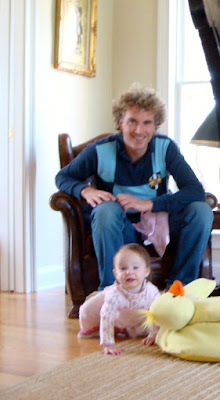 A few months back, I ran into a friend who, together with his wife, had a new born baby. When asked how he was doing, he responded "the baby is great, but my wife and I are stressed out." It seems that his wife, who is at home with the baby, is having a hard time taking care of anything more than the baby -- which is understandable. But, this has added a great deal of stress to my friend, who has a high-pressure job. When he arrives home from work he needs to cook and clean, do laundry, get groceries, take the garbage out, etc. 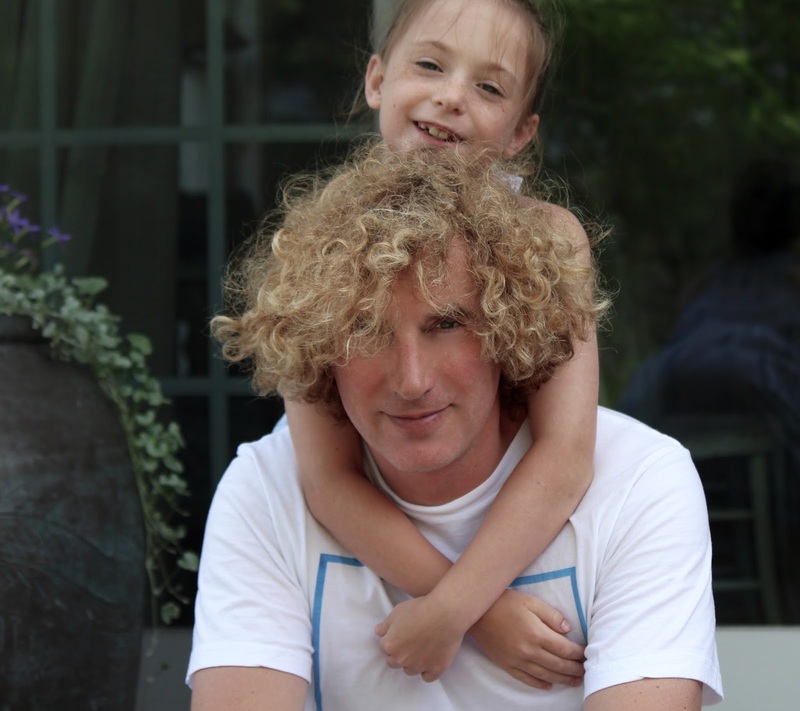 While he adores his child, he is struggling with his marriage. My response to him -- this is normal, completely typical, happens to every new family, and will pass. Adding a third member to the family brings the greatest life, relationship and financial change a couple can experience, and often brings out feelings of jealousy. The main caretaker of the house just doesn't have the same amount of time to give to his/her partner or spouse. It takes time to adjust to this change. One or both parents is sleep deprived (which, did I mention, is often used as a form of torture), the scope of responsibilities has doubled, and there isn't an instruction manual. Recently, I ran into this friend again and he seemed much more relaxed and happy with his family and his marriage. I was relived. It seems they, like most new parents, have found their grove and are going to be fine. While it may be a bit unorthodox to bring up this story on a weekend that we celebrate the 4th of July, I do so to illustrate something important. Despite our differences as families -- we all have more in common than not. I was surprised at myself for being able to offer up marital/parenting advice to my friend. But ultimately, I thought later, we all want to have healthy relationships, raise well-adjusted families, and have some fun at the same time. Straight or gay, or otherwise, we all struggle the same struggles and no matter what type of family we are raising or were raised within, our similarities outweigh our differences. This month, America celebrated an amazing milestone -- marriage equality. No matter how you lean politically, we should be proud that America's children are being raised in a country that strives to treat its people fairly. So, as we celebrate this Independence Day, let's be proud to be American! Beyond our differences, we all stand together in wanting to be in healthy relationships and raise well-adjusted children.